The House Appropriations Committee on Education has proposed less than half of the $278-million for the foundation formula for K-12 education that Governor Jay Nixon (D) recommended in his budget proposal. The Chairman of that Committee, Representative Mike Lair (R-Chillicothe), says the reason is simple. “Because the Governor’s $278-million was smoke and mirrors. It didn’t exist,” says Lair. Nixon’s budget proposal was based on a budget estimate that is higher than that agreed to by House and Senate budget leaders, and based on that higher estimate Nixon budgeted the $278-million figure as part of an overall proposed $489-million increase for education overall. 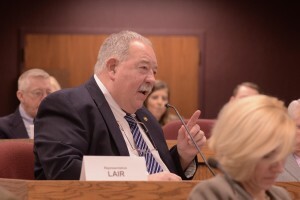 Lair says after being a teacher for 40 years, he is willing to put in the budget for K-12 education what he thinks is available and would include more if he could. “I just can’t in good conscience spend money I don’t have,” says Lair. What he thinks is available is $100-million, which is what the committee has included in its recommendation. “It’s a step in the right direction,” Lair says of that amount of an increase. The committee also recommends $43-million dollars for a 5-percent performance-based increase for 2-year and 4-year higher education institutions. Governor Nixon had proposed $42-million for performance-based increases of 5-percent for 4-year colleges and 4-percent for 2-year colleges. The budget bills the committee has advanced are HB 2002 and HB 2003.